According to the Environmental Protection Agency (EPA), if you are planning any major structural renovations, such as converting an unfinished basement area into a living space, it is especially important to test the area for radon before you begin renovation. Radon comes from the natural (radioactive) breakdown of uranium in soil, rock and water and gets into the air you breathe. Radon can be found all over the U.S. It can get into any type of building — homes, offices, and schools — and result in a high indoor radon level. Radon levels less than 4 pCi/L still pose a risk and since there is no known safe level of radon, there can always be some risk, but the risk can be reduced by lowering the radon level in your Huntsville Alabama home. There are several proven methods to reduce radon levels in your Huntsville Alabama home. The one primarily used is a vent pipe system and fan, which pulls radon from beneath the house and vents it to the outside. This system, known as a soil suction radon reduction system, does not require any major changes to your home. Sealing foundation cracks and other openings makes this kind of system more effective and cost-efficient. Similar systems can also be installed in houses with crawl spaces. The right system depends on the design of your home and other factors. Most homes can be fixed for about the same cost as other common home repairs. The cost to fix can vary widely depending on how your home was built and the extent of the radon problem. 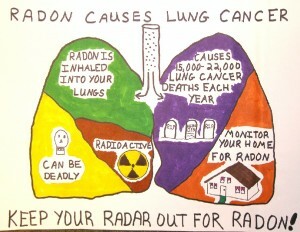 It is recommended that you consult with your state radon office or get one or more estimates from qualified mitigators. Technical knowledge and special skills are required for lowering high radon levels. You should use a contractor who is trained to fix radon problems who can study the radon problem and help you pick the right treatment method for your home. In selecting a radon reduction method for your home, you and your contractor should consider several things, including: how high your initial radon level is, the costs of installation and system operation, your home size, and your foundation type. If you have any questions, or would like a Huntsville Alabama radon inspection, please give us a call today at 256.539.7236, send us an email to joey@radonss.com or request an appointment online for testing.